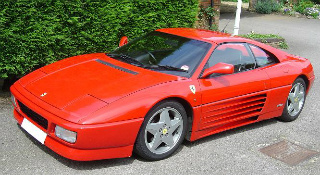 The Ferrari 348 TB sports car, launched in 1989, was the replacement for the 328 and 308 Series which were, over a period of some fourteen years, amongst the best selling sports cars produced by Ferrari. The 348 was offered as both a TB Berlinetta coupe, and a Targa-style TS variant, where the "T" referred to the fact that the gearbox was positioned transversely. In line with the nomenclature of its predecessors, the "34" in the car's name referred to the engine capacity, whilst the "8" indicated the number of cylinders. The 348 TB represented the very first model to be announced since the death of the Ferrari founder in 1988. The body styling was by Pininfarina, and exhibited a distinct similarity to the Ferrari Testarossa, especially in relation to the side air intakes, and the rectangular-shaped rear lights. It used a monocoque chassis to which was bolted the engine sub-frame for ease of engine removal during maintenance. Both were made of steel, as were the body panels. In previous front radiator models, the coolant hoses ran under the cabin. Now, with the 348, both oil and coolant radiators were moved to the sides, so that it was easier to keep the cabin cool. Consequently, the radiator grille at the front now served no useful purpose apart from retaining the traditional image of the car's front section. Parts of the suspension were designed so that the ride height could be adjusted to the prevailing conditions. The interior was well appointed, and included air conditioning, leather seats with adjustable head supports, electrically operated windows, and heated door mirrors. It had vacuum assisted vented disc brakes all round and linked to ABS, as well as two Bosch Motronic 2.5 engine control units. In later models, the battery was moved to the left front wing in order to produce improved weight distribution. When production ended in 1995, a total of 2,895 units of the 348 TB had been built. Introduced alongside the 348 TB in 1989 was the 348 TS sports car, with a Targa top, in which the specification of both was identical. By 1995, when production ended, 4,230 units of the 348 TS were built. Both variants were powered by a mid-engined, double overhead cam, V8 unit, with four valves per cylinder, that was previously fitted to the 288 GTO. It was positioned lengthwise, with a transverse gearbox, which produced a very balanced ad stable arrangement. It was fitted with a Bosch Motronic unit, which controlled both fuel injection and the ignition system, a five bearing crankshaft, and a compression ratio of 10.4:1. The 348 TB developed 300 bhp at 7000 rpm (with the redline at 7500 rpm), and 229 ft/lbs of torque at 4000 rpm. Fitted with a five speed manual all synchromesh gearbox, it produced a top speed of 171 mph, and a 0-60 mph time of 6.0 secs. It used dry sump lubrication in order to eliminate oil starvation when driven or cornering hard. On the second hand market, a Ferrari 348 TB sports car in excellent condition sold at auction for nearly $75,000. On the other hand, a Ferrari 348 TS in good condition would fetch $50,000, whilst a showroom example would command $85,000. More classic cars from Ferrari.